1. Happy Chinese New Year! The Lunar Chinese New Year celebrations have begun and will last for two weeks. This year marks the Year of the Rabbit. Chinese new year is a great opportunity for kids to learn about Chinese culture and Chinese food. Chinese food is fun to make, healthy and delicious to eat. Kids can be exposed to many new and different Chinese herbs, spices, and vegetables. Click here for Chinese New Year recipes. Chinese people eat their food using chopsticks. The Chinese were the first to use chopsticks and they have been using them for over 3,000 years. Chopsticks are used to eat rice, noodles, dumplings, meat and vegetables. If you find it hard to use chopsticks, here are a few tips. Begin by using your dominant hand (right or left) to hold the chopsticks. Hold the top chopstick like you're holding a pencil, gently resting the upper half of the chopstick between your thumb and index finger. Hold the bottom chopstick so it presses firmly against your ring finger on the bottom with the middle finger on top. Hold towards the pointed end of the top and bottom chopstick, about 2-3 inches from the end of each chopstick. Line up both ends evenly. The bottom chopstick stays stationary and the tip of the top chopstick moves up and down using your index finger to control the movement. Pick up food by moving the end of the top chopstick towards the end of the bottom chopstick, catching the food. Be patient. It takes a lot of practice! Start with bigger pieces of food, then work your way to rice, and finally to more slippery foods. I have a confession to make. When I can't pick up a slippery dumpling, I sometimes poke my chopstick into the dumpling. This way I avoid a lot of frustration and embarrassment. With practice, you can master the challenge of using chopsticks! Click here for a picture of how to hold chopsticks. Enter your favorite Asian noodle recipe in the noodle contest. Hurry, entries close on February 11. Many prizes to be won! 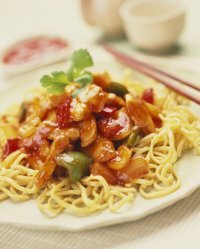 Check out the noodle recipes submitted so far and find out more about the Asian Noodle Recipe Contest. If you love pasta, share your best pasta recipe in the pasta contest for a chance to win a prize. Entries are due by February 28. More details for the Pasta Recipe Contest.